← WINNER: milkbar portable feeding pillow and accessories! New Zealand Babywearing Week Giveaway with Adventure Kids! Hello everyone. We’re on the countdown to New Zealand Babywearing Week (6 – 14 October 2012) and we are looking forward to celebrating with you. Over the next few weeks we will be continuing our fantastic giveaways thanks to some generous product sponsors. The next giveaway will be drawn once we reach 1400 page members over on the New Zealand Babywearing Week facebook page. Our 1400 liker giveaway sponsor is Adventure Kids. One lucky ‘New Zealand Babywearing Week Facebook page’ member will be randomly drawn to take home a medium sized LennyLamb Babywearing Fleece Jacket in Cafe Latte colour. Giveaway value $89.95. (Open to NZ residents only). 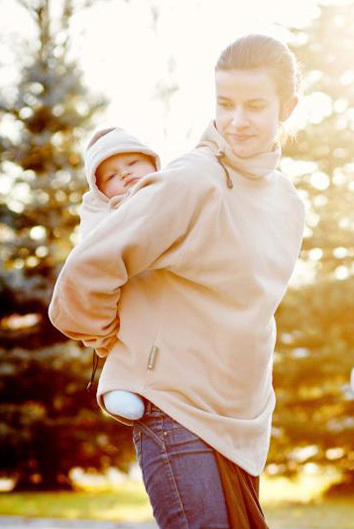 The LennyLamb babywearing fleece jacket is a warm and cosy jacket which is worn over you and your baby in a carrier. This jacket can be worn with the carrier pouch at front or back, allowing for both front and back carries. Comes with matching hood for baby. Like the Adventure Kids Facebook page. Update your Facebook status with the following: “I’m in to win a LennyLamb babywearing jacket with @New Zealand Babywearing Week and @Adventure Kids. You will need to ‘like’ the New Zealand Babywearing Week and Adventure Kids Facebook pages for the tags to work and remember to make sure your update is shared as ‘Public’. To do this click the drop down menu to the left of the ‘post’ button in your status update section on your wall and choose ‘Public’. Leave a comment under this post to let us know why you would like to win the LennyLamb fleece babywearing jacket. This entry was posted in Giveaways and tagged Adventure Kids, babyweairng coat, babywearing jacket, LennyLamb, New Zealand Babywearing Week, NZ Babywearing Week. Bookmark the permalink. I’d like to win the LennyLamb fleece babywearing jacket- it’s a brilliant idea, I’ve been breaking zips all over the place trying to fit bubs into my coat with me. I’d love to win a babywearing jacket; I wear my son on my back so much but there is no easy way to wear a jacket while doing a back carry! This would be utterly perfect for us!!!!!! I’d love to win the LennyLamb jacket, so useful! This would be awesome to win so I could keep bubs and me cosy for long walks on cool days! i would LOVE to win the LennyLamb Jacket boy it would be awesome. wow what a great idea… perfect for the back carries I don’t have any clothes that even nearly fit around us when we do this… fantastic!!! This would be so awesome for wearing my little guy instead of mt XXL sweater over us both! I would love to win a lenny lamb fleece jacket, perfect for those chilly early morning rugby games. I would LOVE one of these, then perhaps I could be warm on our walks too. I wrap Ollie up all snuggly to go on my back but I only wear a top and a cardi. Hoping for lots of walks in the Barrier bush over summer and it can still be pretty cold! Then when winter rolls around, it’s perfect.. I don’t have anything that I could wear to keep us both warm while back carrying (or front, for that matter) and this looks amazing. what a great idea, I don’t have a decent carrier and this looks lovely and warm as well. I would love to win a LennyLamb babywearing jacket as they look so cosy and warm.